Kids are very much fond of crafts. A simple craft can make them very happy. You can make them happy with crafts in two ways. The First one is make your own crafts and present them. The second one is helping them to make their own crafts. Making crafts is a very good idea to celebrate various occasions. But I think this works best in the Easter Holiday. 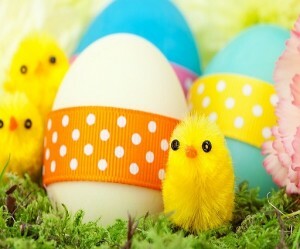 You can give a wonderful experience to your own kids as well as kids of your friends and neighbors by Easter crafts. And the happiest thing is that there are a lot of crafts easy to make. These easy Easter crafts can be used in school parties, home decoration or classes in the church. In this article various easy Easter crafts are discussed so that you can easily make one or many of them. Here at least one of each kind is discussed to make your Easy Easter crafts for kids. At first, tape some construction paper around the chip-can. Then glue some pom-pom or eye in such a way that it will look like a funny face. Cut out paper of ear shape. And glue them on two sides of the box. Then make two holes on two opposite sides of the box. Then just bend a pipe cleaner into the holes to make handles. A long piece of construction paper also can be used. You can also make some designs or drawings on the basket instead of a funny face. At first take a 6 in × 20 inch cardboard. Join the two ends of the side of 6 inches to make a shape of a circle and glue the two parts or staple the parts. Then place and glue it to make the bottom side of the basket. Then glue some Easter wrapping paper around it. Make an inch wider and long cardboard to make handle. Just bend it glue on two sides of the basket. You can decorate it with eggs, stickers and color. At first a drawing of a butterfly is needed. If the kids you are working with are old enough to draw a butterfly just let them do. But if you are working for very little kid, you can use a printed copy of butterfly from the internet. Then cut the butterfly and color it. Kids are very much interested in coloring. So give them a lot of color preferable dark to make their butterfly colorful and attractive. Then glue it in a stick made of wood. To make the chrysalis, use a roll of toilet paper. Then gently curl the wing of the butterfly and slip the wings into the chrysalis. It can be a very nice toy to play. Just wave the sticks to make them fly. You can also use it for decoration of your home. Using these materials you can also make an angel or Jesus. Buy some eggs of foam shaped. You can get it from any craft shop. Then roll it on the glue. Then roll it in glitter. Glue some shining stones, beads to make it attractive. There are many more exciting Easter egg decorating ideas you may want to browse on. You should be careful about the age of children that you planned for. The choice of crafts and materials should be according to their age. Easy, light and cheap materials such as old paper should be selected. They should be colorful to attract children. I would like to suggest something that is useful like a basket. It is because when children find out that their simple thing is used in some purpose, this brings happiness to them and inspires them to make something good for use. Easter Holiday is one of the most important religious festivals of Christians. It reminds the important values of Christians. Make this easter worth remembering by sharing the thoughts with Easter wishes. Every Christian wants to make it memorable. So best of luck with your Easter holiday!